Travel with Kevin and Ruth! : There is too much to see! Every corner you turn in New York City leads you to a new street that you've never been on before. We could easily spend more than one full day just in Lower Manhattan. Good thing we're coming back here for three more days in March. We did at least another 10 mile (16 km) walking day yesterday. We started off by taking the subway from where we're staying in Washington Heights to New York Penn Station. From there, we walked to the Hudson River, trying to find the High Line Walk. This is an old raised railway line that has been turned into park space and a walking path. It runs about a mile. They're doing construction at the north end of the walk to extend it, so we had a little trouble finding the entrance. But we found it, and even on a Monday morning it's become a popular tourist attraction! Construction at the north end of The High Line Walk. Great idea somebody had. Turn an old railway line into park space! lots of interesting views along that one mile section. And lots of interesting architecture. And lots of people. We decided that we would NOT want to do this walk on a busy day. A few "interesting" sculptures along the way! Our goal after finishing the High Line walk was to head over to the Brooklyn Bridge and walk to the half way point for the view back at "the city". It was quite a ways to go, and we ended up a bit in circles trying to find the entrance to the pedestrian walkway due to more construction in that area. We walked under the Municipal Building, when we should have gone right beside it. Close, but not quite! This led us about another half mile out of our way, and we ended up having to ask a few people how to get back there! Lots of people out enjoying the day. It was a nice sunny day, but the high was only around 46F (8C) so it was a little chilly. 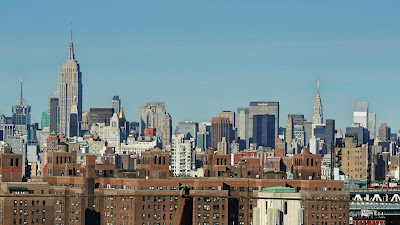 And the north skyline of Midtown Manhattan. the Empire State Building on the left, and the Chrysler Building on the right. From there, we found a telephone and got in touch with Jon, another couchsurfer who we had contacted but who wasn't able to host us this time. But he offered to show us around a bit and we wanted to take him up on his offer. We agreed to meet at 5:30pm, and that gave us time to take the free Staten Island Ferry! Taking the ferry gives you great views of the entire New York City harbour, as well as the skyline and the Statue of Liberty. A must see for any tourist! Did we mention it's free?! Statue of Liberty at dusk. Lower Manhattan skyline at dusk. By the time we finished the ferry, it was pretty much time to meet up with Jon. It gets dark now around 5:30pm, and so our walking tour with Jon was at night. That was fine, and he brought us around Wall St. and explained about a lot of the older buildings in the area. Jon has lived in New York City for about 40 years and is very knowledgeable about some of the history and buildings. And, he was in lower Manhattan when the twin towers came down on September 11, 2001. Speaking of which, you can see in the picture immediately above that the Freedom Tower (tallest building on the left) is almost complete. The New York Stock Exchange building. Jon, telling Ruth a story about this restaurant. We went to Mighty Quinn's BBQ joint for dinner. We are eating out a lot on this trip! But, great food and reasonably priced at $34 for the three of us. Can definitely recommend this place for BBQ ribs and brisket. I'm exhausted just reading about this, but oh, wow! What a day...and night. Thanks for sharing! Love the header (tugboat) pic, and that rail line converted to a walkway is fantastic! Wow, that is a lot of touring in one day. 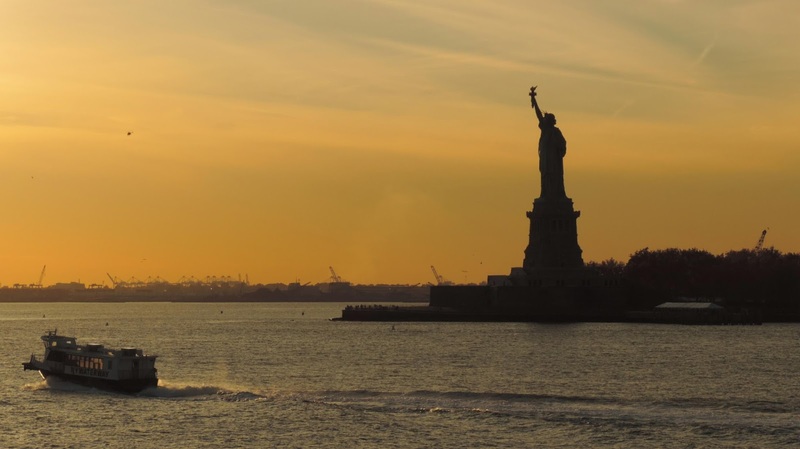 I loved the photo of the Statue of Liberty at dusk. We will be looking for you on Letterman tonight! By all the walking you and Ruth do, you see so much more of the 'real essence' of the places you visit. This post is like a travelog for future visitors to NYC. Thanks and have fun with Letterman! You should have been exhausted after all that walking. But I, for one, really appreciate all the wonderful pictures. We haven't been there for 30+ years. Thanks for all the memories. You two pack alot into a day. Have fun at the Letterman show. I went to a Letterman taping back in 1997. It ruined talk shows for me when I saw how they're actually produced. Check out Dave and the guests when they go to commercial and the stage is darkened. Wow you guys are sure having a busy visit here. We are getting tired just following you. Are your necks getting 'stiff' , yet, from ALL of the LOOKING-UP?? Thanx, for the 'wandering-around', yesterday; kinda Like George Yates... I'd seen & read about the HIGH-Line walkway, but it was just a bare walk, then; now, it is really a PARKway walking path... Sorry, y'all didn't get to 'do' the Brooklynn Bridge, but some keeps BUYING IT and they have to build a new one... That's how Bloomberg makes his billions; he and Trump.... What happened to the TUGBOAT pic?? More people RUSHING around isn't interesting, but the tugboat on the river was... I'll be glad when we get to Namibia, out in the wilds and away from the hectic modern rush of things... Hope today's warmer and a HAPPY DAY. Sure am glad y'all did the NYC thing and all we did was look; it's just tooooo busy for an old man used to WIDE OPEN SPACE !!!! Thank you, anyway !! !